The Myrtle Beach area is South Carolina's prime coastal family vacation destination. At North Myrtle Beach, you can experience a quiet getaway or enjoy the many attractions and water activities in the area. Even from the peace and quiet of North Myrtle Beach vacation rentals, you'll find that you're in the center of it all, without spending a fortune on hotel and motel rooms that don't even come close to the experience you can have at North Myrtle Beach rentals. Aside from miles and miles of beaches, North Myrtle Beach is close to the haven of amusement parks and entertainment that line the Grand Strand. It quickly becomes apparent that this is certainly a kid-friendly town with places like the Family Kingdom Amusement Park, the Children's Museum of South Carolina, and the various water parks and miniature golf courses throughout town. From a North Myrtle Beach vacation rental home, you can experience it all, and wind down at the end of the day in an accommodation that is large enough for the family to feel rested and relaxed. There is plenty of beach real estate to park a beach chair and catch some rays at North Myrtle Beach. The abundance of water also makes the area perfect for boating and fishing, as well as other water activities such as kayaking, windsurfing, parasailing and other water sports. Backwater areas like winding creaks, the Intracoastal Waterway, and the expansive marshes make for watery adventures the whole family can partake in. At North Myrtle Beach condo rentals, you will feel like this is your home away from home. After a long day out on the water, the space also includes a fully functional kitchen so meals can be prepared in house rather than sought out at a crowded restaurant. 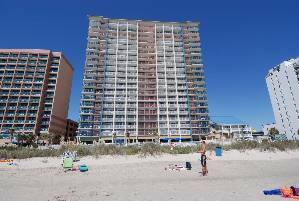 Yet, North Myrtle Beach rentals are so close to the action that you could take advantage of a dinner in town. The area is also noted for its shopping venues as well as live music and theater shows, so everyone in the family is sure to find something that they can enjoy. A stay at North Myrtle Beach vacation rentals can be an unforgettable experience, and the quality appreciated at an affordable price suitable for you vacation budget. The savings will certainly leave open the opportunity for the adults to spend a night out on the town, and buy souvenirs and snacks along the boardwalk which can be the highlight of any afternoon. Contact a home owner early in the season to get the North Myrtle Beach vacation rental home of your choice. The area is a popular destination and if you plan accordingly, you will soon find out why. There is so much to do and when you stay at North Myrtle Beach rentals, the whole family feels the benefits that most other hotel and motel tourists in town don't even know exist. Interested in More North Myrtle Beach, South Carolina? Check out nearby Conway , Garden City , Garden City Beach , Myrtle Beach , Ocean Isle Beach , Sunset Beach .